Sir Lincoln Joustalot requests a token of your favor. 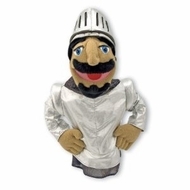 This unique royal puppet features elegant hand detailing and materials carefully crafted for years of pretend play. Measures 16.5" x 7" x 4.5". Materials carefully crafted for years of pretend play! Your child's imagination will take them away! Colorful and exciting adventures await!